To make a print, a pencil drawing is made, then the image is rubbed onto a block of safety-cut, a material that is much like the material used for erasers. The block is carved with hand tools. If the card is to be in multiple colors, the process is repeated for a second block. 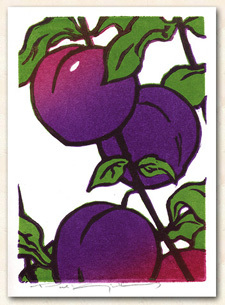 To print the cards, ink is mixed on a slab of marble, then rolled on the block with a brayer. 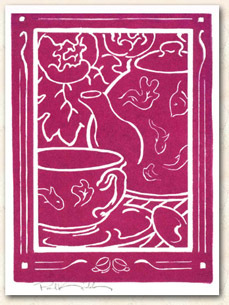 The card is placed on this, pressed with a small hand press, and then finished with hand rubbing. 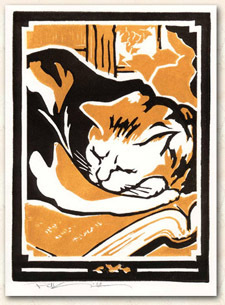 Although the materials are modern, the techniques are derived from some of the most ancient forms of printing. For this print a single color on a single block is used. The result is a print with two colors: the rolled color and the white left by the carved spaces. This print uses two blocks, each with a single color. This adds a third color, but adds the further challenge of getting the two block to "register," i.e. to line up properly with one another. Here is another way to make multiple colors. 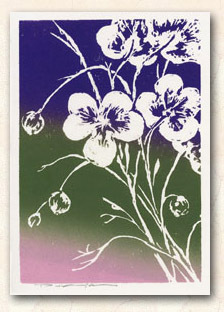 Three different colors were combined on a single brayer. This is called a "rainbow roll." In this one the techniques of the last two cards are combined. Two blocks are used and the first one is done with a rainbow roll. More complicated still, the first block is green and the second block is a rainbow roll of purple and magenta, but by using ink extender to make the inks of the second block semi-transparent, yet another color is produced where the inks of the second block are printed on top of the green of the first block. This color is the dark color of the stems and outlines. 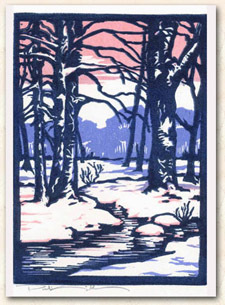 Many more descriptions of techniques by all sorts of block printers can be found on our "Block Printing Techniques" page.